Do you wake up with pain under your heels in the morning? Are they sore after a long day of work? Heck! Your heels might be sore all of the time. Heel pain is one of the most common problems that your feet are likely to suffer from. Our podiatrists help people like you improve their pain every day. Today I am covering tip number 3 of 5 on things you can be doing to help ease your heel pain. Check out our blog to find more tips. So how do I stretch this area? It is really quite simple for you to stretch your arch. Sitting on the edge of your bed, bring the sore foot up into your lap (like the picture above). Grab your toes, and pull your toes and foot toward your shin. This will give you a good stretch under your arch. How long do I hold the stretch? Hold the stretch for 20 seconds, relax, and then repeat twice more. Every morning before getting out of bed. Also it can be helpful after you have been sitting for a while. Do it after Tip 2 (arch massage) to get even better relief. Starting your day by stretching out your arch should make getting out of bed easier for you in the mornings. Now, as with any exercise, if you feel that it doesn’t feel right or is making the area more sore, stop the exercise immediately. If this happens to you, it is time seek the assistance of a podiatrist to help you to diagnose the condition correctly and provide the right treatment plan. Keep an eye out for next weeks blog which will be covering calf stretching. This is another exercise that can really help to take the load off the foot. 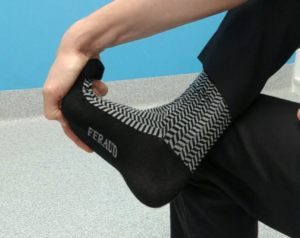 If you missed last weeks on arch massage for heel pain, here it is. This entry was posted in Blog Posts on December 2, 2018 by Feetology.